A few weeks ago, I got an email at work advertising a free technology event for teenage girls run called DigiGirlz. 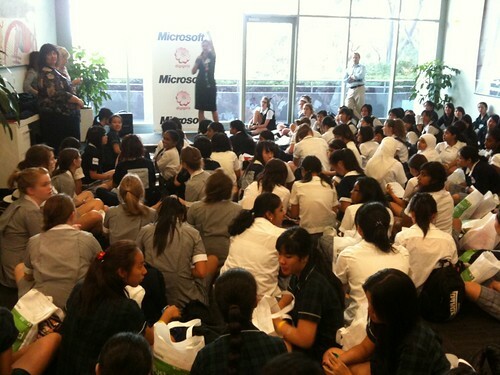 It was being run by Microsoft Australia and it’s aim was to promote careers in the IT industry for girls. It’s a good idea. Women are far too under-represented in IT in Australia (and probably other parts of the world too) so I’m all for supporting any initiative that can help attract smart, creative women into the world of technology. The event sounded like it would actually be pretty interesting. It was being held at Microsoft’s main Australian Offices at North Ryde and offered a chance to meet some of the inspirational women who work at Microsoft to find out what they do, and to have a chat with several Australian universities about the sorts of career paths that IT might offer. There was also a couple of hands-on workshops in Microsoft’s Photosynth and DeepZoom technologies, as well as a chance to to see the new Project Natal gaming platform. It all sounded pretty interesting to me! However, we don’t offer any IT courses at PLC (that’s right, none! Something I’d like to see change!) so I wasn’t quite sure who I’d ask to attend the event. After a phone call to RSVP for the day we were offered 15 places at the event, so, using the Feedback Module in Moodle to collect details of interested students, I offered it to our Year 10 students on a first-in, best-dressed basis. 13 students responded positively and when the day arrived (March 24 – which was Ada Lovelace Day of course!) we all bundled into the PLC minibus and made our way up to North Ryde. The folk at Microsoft went out of their way to try and give us a great experience and provide a range of things to see and do. They gave each student a goodie-bag with information, fed them with snacks and drinks, and then put them into groups and rotated them through the 4 sessions. We had a short address by a very dynamic female executive who works at Microsoft Australia and a few shorter addresses by several others. While it was a lovely gesture to feed the students before they started the sessions, getting teenage girls all revved up on soft drinks and chips just before you then ask them to sit still and listen for the next few hours was not a great idea. The discussion sessions with both the women from Microsoft and also the university people were informative, but too long. Kids don’t want to just sit and listen like that, at least not for that long! The hands on session in Photosynth and DeepZoom was pretty good, although there seemed to be a few technical hiccups in the session I saw. I’m still not really sure what to make of these technologies, and beyond a mild cool-factor, I wonder just how useful they really are. The biggest disappointment was the session about the Project Natal platform. Natal is the next generation of the XBox 360, and takes gaming to a new level by enabling natural interaction without wires or controllers. It’s been floating about on YouTube for a while now, but I was really keen to actually see it in action. Alas, all we got to actually see of Project Natal was a PowerPoint with a few videos (the very same ones that are on YouTube) Although we were told that Natal was getting close to release for this year, there was no working demo to play with. Despite the fact that we were being told about Natal by former FragDoll, Ashley Jenkins (who totally knows her stuff when it comes to games!) we didn’t see any live game demos at all. I thought this was a big mistake by Microsoft, and I thought it odd that a product apparently so close to release would not be given a demo. It would have been good (even expected!) to see Project Natal in action, but even without the live Natal demo I thought we would have at least had some real live gaming action with Ashley, perhaps showing us what a really serious gamer is capable of on the regular X-Box platform. Instead, we saw a PowerPoint with a few product roadmap slides and a brief exposé of Ashley’s gamer heros. To be honest, I was looking forward to this session the most, but I thought what we were shown was a bit lame under the circumstances. It might be good in future events to include some sort of hands-on programming experience – kept fairly simple of course – as there would be many students who have never had a go at programming a computer before. Overall though, despite these little criticisms it was a worthwhile experience and the feedback from students that I saw was politely positive (although I felt it could have been much more hands-on, practical and faster-paced to hold the full engagement of the students). PowerPoints and roundtable talkfests might be fine in the corporate boardroom but this style of presentation misses the mark somewhat with most teenage girls. I know that quite a few people mentioned this in their evaluation forms, so I’m sure that next year will be even better. There was an interesting story in today’s news about Microsoft CEO Steve Ballmer’s outburst at an iPhone-carrying Microsoft employee. Apparently, Ballmer was addressing a company gathering when the employee pulled his iPhone out to take a picture of him. Ballmer went nuts. He grabbed the phone, ridiculed the employee publicly, then pretended to stomp on the device. You can read the full story over on Engadget. There is even an alleged photo taken as Ballmer reached for the device. Ballmer is an interesting character. Certainly there is plenty of evidence on YouTube of his over-the-top antics as he revs up Microsofties with his ranting and raving, screaming and yelling. And who could forget his chant of “Developers! Developers! Developers!” at a gathering of software developers, as he tried to make the point that Microsoft’s success was partly due to its army of, well, developers. It’s even spawned a remix version. Even back on the very early days of Microsoft, Ballmer was seen dressed up as a cheesy salesperson, doing the whole “How much would you expect to pay?” spiel as he promoted Windows 1.0, throwing away dollar bills in an over-the-top display of sales showmanship. If you don”t know much about Steve Ballmer or where he fits into the Microsoft story, I’d recommend you watch the excellent video series by Robert X Cringely, “Triumph of the Nerds“. It’s a wonderful record of the first 20 years of the personal computer revolution, and if you call yourself a geek, you absolutely should see it. I got thinking about Ballmer as I read through the comments on the Engadget blog. One person made the comment that Ballmer was stupid. Another came to his defence, noting that Ballmer was overly brash and passionate, but not stupid. The Sydney Morning Herald even ran a story with a psychologist analysing Ballmer’s crazy antics, concluding that Ballmer isn’t crazy, just an attention seeker. I actually met Ballmer once. I was at a fairly intimate Microsoft function in Sydney for the launch of Office 2003, and I managed to sit in the very front row directly in front of Ballmer as he gave his address. 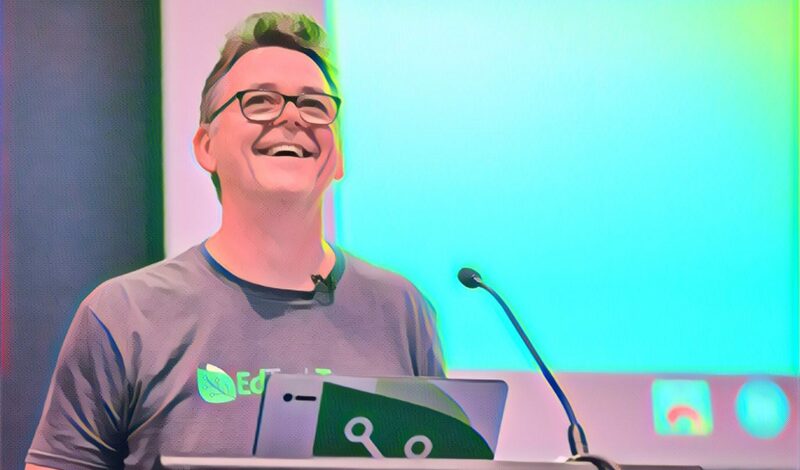 He spoke to the small crowd in a very reserved tone, talking earnestly about the development of the new software, and giving some background into the challenges and successes of getting it to market. I was actually quite impressed with Ballmer, and was struck by his obvious passion and belief in what he was doing. When he finished his talk, he asked if there were any questions, so I stuck my hand up and asked one. To be honest, I thought it was a bit of a curly question and I was sort of hoping to stump him a little. To the contrary, Ballmer looked right at me and fired back a detailed and well-thought out answer, explaining how Microsoft was addressing the issue I’d raised. He outlined three aspects to his answer and confidently explained each one. There was no fumbling or dodging the question. He knew what he was talking about and clearly had given a lot of thought to the issues I asked about. I was actually a little surprised at just how well he responded, and at the quality of his answer. I was impressed not only by the clarity and detail of his answers, but also by the fact that, as CEO of Microsoft, the intricacies of how the software works and a detailed answer to the question I asked (which was related to how Microsoft was addressing the issues faced by software training providers and how it was coming up with ways of making it easier for users to learn to use new software versions) were not typically the sorts of things you’d expect the CEO of the company to be so close to. Ballmer is a hands-on kind of guy and he’s clearly passionate about Microsoft. And he knows his stuff. As the Engadget commenter remarked, he may be brash and passionate, but he is clearly not stupid. I’ve seen the thoughtful, intelligent and focussed side of Steve Ballmer, and I’ve seen the outrageous, wild and crazy side of Steve Ballmer. Perhaps the yelling and screaming, the running around the stage like a sweaty crazy person, the (pretend) iPhone smashing behaviour, the silly comments about the iPhone, the blunt denigration of anything non-Microsoft, is all a bit distracting from just how intelligent Ballmer can really be. Me too. Stay crazy Steve. Because I was doing a bit of blog navel-gazing tonight writing that last post, I decided to take a quick look at the site stats just to see what’s happening there. One of the figures that really jumped out at me was the one shown in this graph. As you can see here, the majority of browser share is now coming from Firefox! Of course this is only just the stats from my blog, and being an educational blog with a predominantly teacher audience I guess there may be a disproportionate number of users who don’t use Internet Explorer, but I was still surprised to see Firefox edging out IE. Not so long ago IE had no competition at all, then Firefox came along and started to gradually steal market share, but last stats I read still showed it with a fair way to go before it could claim to have a greater share than IE. Based on these numbers, Internet Explorer 6 and 7 combined only account for 38% of the traffic! That’s a huge drop and won’t be making Microsoft happy at all. As a Flock user myself (which is based on the Gecko rendering engine in Firefox) I’m pleased to see the gain. By the way, I exclude my own visits to the site to try not to skew the numbers. Ok, I must admit I’m impressed by Microsoft’s new table-like project called Surface, which Bill G has been showing off lately. It’s a multitouch capable computer that works in a table form factor. There are some obvious uses of it, like restaurants, casinos, etc where transactions take place largely on a table. I don’t know how commercially successful it will be but I think it’s a pretty cool technology! Watch the video and check it out for yourself… I particularly like the way it interacts with devices like digital cameras and PDAs. I presume those devices would have to have some form of wireless interconnectivity such as Bluetooth or Wifi? Very cool though! You might think that your world of browsing the web begins and ends with that little blue “e” logo on your desktop, but you might be surprised at just how many other (better?) alternatives exist out there. Over the years I’ve probably had a play with just about every web browser I can lay my hands on, but I thought it might be interesting to talk about some of the others. Browser life began in 1992 with the granddaddy of them all, Mosiac. However, after the famous “browser wars” between Netscape and Microsoft many years ago, it seemed like Internet Explorer was destined to be the only browsing kid on the block. Of course, for the alternative thinkers amongst us, there were some notable options like the wonderful Opera browser which just got better and better with every version, but for all intents and purposes it appeared that Microsoft had won the browser battle with the ubiquitous Internet Explorer. Was it a better browser? Probably not. Of course, Netscape never really went away. In a stroke of inspired genius, or possibly desperation, Netscape decided to give away the source code for its browser to the Open Source community and gave birth to the Mozilla Foundation. With a global volunteer workforce of dedicated programmers and engineers, the end result – Firefox – has evolved into what many believe is the world’s best web browser. With a sleek and lean codebase, sensible security features, plenty of extensibility and customisation options with Add-Ins and Themes, Firefox has plenty of good stuff to talk about. It’s fast, it’s powerful and it’s free, both as in speech and as in beer. Firefox has also forked off other into interesting browser projects such and Camino and Flock. There are other players too, like Apple’s Safari, itself built on KHTML code, which forms the basis of KDE’s Konqueror, another browser with an Open Source Linux heritage. Using a variation of the KHTML source code, Apple developed a rendering engine called Webkit and this in turn spawned more browsers such as Shiira, OmniWeb, Sunrise, wKiosk, and Bumpercar. Webkit also forms the basis of a diverse range of other related web tools such as Adium, Growl, SubEthaEdit and Vienna. Flock is an amazing web browser built on fast and secure Mozilla technologies. View and share photos with an innovative new photo bar in the browser. Subscribe to your favorite websites to get the freshest content automatically, in summaries that are easy to save and blog. Search more quickly, more effectively, and more richly with the innovative Flock Search Toolbar. Download the Flock beta and you’ll be spreading the word that there’s a new way to web. Some of the neat things I’ve discovered in Flock (thanks to a chat I had with Judy O’Connell the other day) are the ways in which it integrates with services such as Flickr. Photos stored in your Flickr or Photobucket accounts can be easily accessed and added to blog posts, and with many new Nokia phones now having direct Flickr integration, this could get pretty interesting. Flock also has some pretty innovative features for storing photos or snippets of information that you find while browsing the Web, so you can reuse them later. The inbuilt search tools dig through not only the Web’s major search engines like Google and Yahoo! but also your own local bookmarks, giving and added richness to searches. It comes with a very easy to use inbuilt RSS feedreader, shared online bookmarks to del.icio.us or Shadows, and a neat blog integration feature that let’s you select any text on a webpage to instantly create a post about it and add it to your blog… (in fact, this post you’re reading right now began life as an experiment in using that very feature). For those times when you want to blog about other stuff you find online, Flock appears to have some incredibly useful features. So check it out… if you’re a serious blogger, Flock looks like a very interesting alternative! I have spent a large chunk of my computing life in Microsoft Office. As a teacher, I think it’s hard to avoid. Tools like Word, PowerPoint and Excel form a sizable basis of the sorts of tools we use every day to create and present stuff to our kids. I even have a few “qualifications” in Office, from a bunch of Brainbench certificates, to an International Computer Driving Licence, and even a few units from the Microsoft Office Specialist certification program. I mean, if you’re going to spend a lot of time in these apps, you may as well know how to use them properly, right? I recently had to create a few teaching resources using Microsoft Office 2007. Office 07 is a fairly radical rethink of the interface for the Office suite. The trouble with previous versions of Office is that they had so many features and tools that most users never found them. Many were buried so deep in the interface that the average user simply never stumbled across them. I even had an semi-heated discussion with a guy at a technology trade show once who was telling me that certain features would be really neat to have in Excel, and when I told him that everything he was wanting was already there, he argued back that I was wrong… these tools simply didn’t exist in Excel. I showed him, he was amazed that he had overlooked them. even though he considered himself a “power user”, he had never found some of these must-have features, some of which I thought were pretty obvious. After I showed him they were there, he was a happy camper again. The other interesting development in the Office space is Google’s recent announcement to add a presentation module to the already existing word processor and spreadsheet modules in Google Docs. Sure, it won’t have all the bells and whistles that MS Office has, but like I said, most users never use the more advanced features anyway. For the majority of users, if they can type and format a document, calculate some numbers or keep a list in a spreadsheet, and do a basic presentation for an audience, that’s most of their computing needs right there. Add in the Gmail and Google calendar features, and Google Docs is starting to look like an interesting proposition. It also has two nice extra features… it can enable online collaboration on documents, and of course it is free. Free is good. Free is hard to beat. At school, we just renewed our Microsoft licensing agreement for the year and it cost us about $18,000. That’s every year. As I say, free is good, and Google Docs is starting to look very attractive, especially now you can even brand it with your own domain name using Google Apps for your Domain. I’m sure Open Office and some of the other open source office stuff is also worth a more serious look these days. The downside of Google Docs of course is that it requires a user to be online all the time, with a fairly fast connection if it is to be at all usable. But that’s becoming more the norm, and is probably not a big issue. The flip side of that is that it makes all your documents available online, anywhere, anytime, which can certainly be a good thing in a Web 2.0 world. 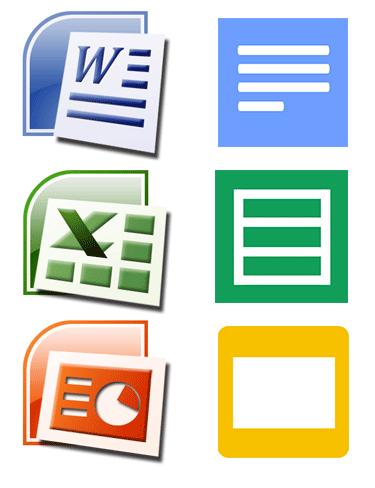 For me, I will keep using Office for now because I do tend to regularly tap into many of its more advanced features. But I can see a day in the not too distant future where even I might start to seriously rethink my attitude to the alternatives.